It was a bright, crisp morning today. The frost was hard and the the air was clear. The sky was blue and the sun shone brightly. Not that I saw that mind as it was dark when I went to work! I must be honest though and say by the time I reached the top of Frocester Hill the sun was rising and the pastels colours of the early morning sunrise over the Cotswold’s was breathtaking. By this time the car had warmed up and I could actually see through the frosted windscreen. Meanwhile as I was dodging fast HGV’s, fast cars and slow cyclist en route to Bristol, Ali was out with his camera capturing some wonderful shots of what is fast becoming a magnificent structure. The new Shack is coming along well, with dark unbreakable tiles on the two story section completed. Not that you could see the colour today as the roofs were white with frost. 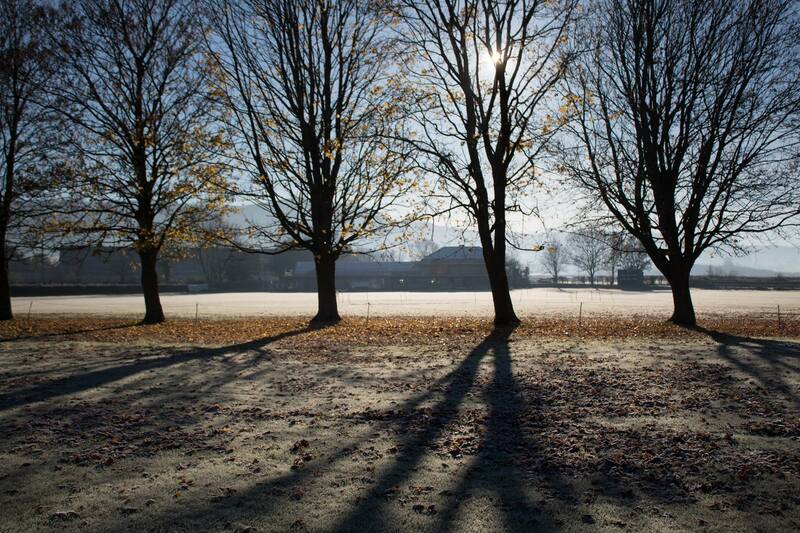 Doorsie has taken some very atmospheric pictures in the early morning sun I think you will agree. It has been a few weeks since I last physically saw the building in daylight so hopefully this weekend I can make the trip up to Pounds Close and have a look myself. That is in-between playing Father Christmas at a school somewhere in Stroud, watching the rugby at The White Hart in Leonard Stanley, The Advent Lunch at The Frocester George on Sunday and the last quiz before Christmas at The Kings Head, Kingscourt in the evening. Blimey I just realised there are a lot of pubs mentioned there. For those who may have missed the last post, it is normally played on a bugle by a young soldier. Sorry, enough of the poor attempt at humour, these and previous photos are on the main website under pavilion update and they include some of the internal work going on. Although I understand that the inside has changed dramatically in the past few days as there are floors being laid and electric cables everywhere. I also hope soon to get an interview with Whif, where I can ask such important questions such as where have you been, what does the future hold for our illusive man about town and his views on the new clubhouse. Plus how much did you get by selling Keith Wand’s spectacles and who is going to win Strictly Come Dancing. Stay tuned good people. < An insiders view . Stunning pictures ! A Winter Wonderland ! Roll on the Summer !